EL DORADO, Kan. – The No. 4 Seward County volleyball team has earned at least a share of the Jayhawk West title following a sweep of Butler on Saturday. With two matches to go, the Lady Saints hold a two-match lead on Hutchinson for the Jayhawk West. The win also marked the 15th straight win for the Lady Saints. Clinching at least a share of the conference didn’t come easy for the Lady Saints. The Grizzlies kept the first set tight through the first 20 points. Tied 10-10, a Giovanna Tapigliani kill and a Butler service error gave Seward a two-point lead. The Lady Saints would not surrender the lead again in the set, extending the two-point lead to a seven-point set win, 25-18. Determined to steal a set from the Lady Saints, the Grizzlies came out in set two with an early 7-10 lead. The Lady Saints never let the set get out of hand however, slowly decreasing the lead, until they took over late in the set, 18-17. 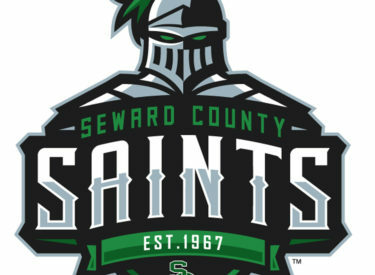 The small lead was all Seward needed to get back their momentum. Tapigliani ended the set with back-to-back kills, giving the Lady Saints a 2-0 lead winning set two 25-22. With the momentum, back on the Lady Saints side, the Grizzlies quickly caved in. In the best set of the day for Seward, the Lady Saints began with an 11-3 run, with Tapigliani accounting for four of the points. The Lady Saints weren’t done however, ending the set on a 14-7 run, to extend their lead to 15, winning the set 25-10, and the match 3-0. The Lady Saints were led by the all-around effort of Giovanna Kuntze. Kuntze finished with a triple -double, the first for the Lady Saints since Sheina Fernandes recorded one on October 21, 2009 against Pratt. Kuntze ended the match with 10 kills, 27 assists, and 17 digs. Her 10 kills came from only 11 attempts, for an astonishing .909 kill percentage. Tapigliani led Seward in kills with 17, while coming one digs away from a double-double. Defensively, the Lady Saints finished with six blocks, with Sierra accounting for five of them. Nathiellen Machado reached double-digits in digs, finishing with 12. The Lady Saints have a chance to win the Jayhawk West outright at 6:30 p.m. on Wednesday (Oct. 25) night in the Greenhouse when they host the Colby Trojans.